Motor Home Specialist is the #1 Volume Selling Motor Home Dealership in the World. Over $165 Million Dollars to Choose From. New RVs from $17,999 Travel Trailers to Over $2,000,000 Bus Conversions and Every Type & Price-Point in-between. No Games. No Gimmicks. Upfront Pricing on Every Make and Every Model. Minimum 25% Off M.S.R.P. on All New Motor Homes. 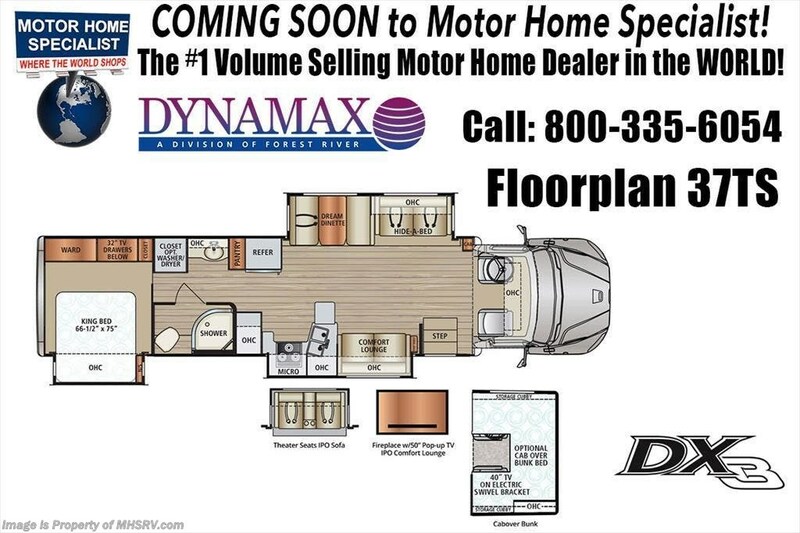 Visit MHSRV.com or Call 800-335-6054.<br />3-25-19 <a href="http://www.mhsrv.com/other-rvs-for-sale/dynamax-rv/"><img src="http://www.mhsrv.com/images/sold-dynamax.jpg" width="383" height="141" border="0"></a> MSRP $326,173. 2019 DynaMax DX3 model 37TS with 3 slides. Perhaps the most luxurious yet affordable Super C motor home on the market! Features include the exclusive D-Max design which maximizes structural integrity & stability, Bilstein oversized shock absorbers, diesel Aqua Hot system, Kenwood dash infotainment system, brake controller, newly designed aerodynamic fiberglass front & rear caps, vacuum-Laminated 2" insulated floor, brake controller, one-piece fiberglass roof, Roto-Formed ribbed storage compartments, side-hinged aluminum compartment doors with paddle latches, integrated Carefree Mirage roof-mounted awnings with LED lighting, heavy duty electric triple series 25 entry step, clear vision frameless windows, Sani-Con emptying system with macerating pump, luxurious porcelain tile flooring, decorative crown molding, MCD day/night shades, solid surface countertops, dual A/Cs with heat pumps, 8KW Onan diesel generator, 3,000 watt inverter with low voltage automatic start and 2 upgraded 4D AGM house batteries. This Model is powered by the 8.9L Cummins 350HP diesel engine with 1,000 lbs. of torque & massive 33,000 lb. Freightliner M-2 chassis with 20,000 lb. hitch and 4 point fully automatic hydraulic leveling jacks. Options include the beautiful full body exterior 4-Color package, theater seats, cabover loft, solar panels, rear rock guard and 2 burner electric cooktop IPO gas range. The DX3 also features an exterior entertainment center, Jacobs C-Brake with low/off/high dash switch, Allison transmission, air brakes with 4 wheel ABS, twin aluminum fuel tanks, electric power windows, remote keyless pad at entry door, Blue-Ray home theater system, In-Motion satellite, flush mounted LED ceiling lights, convection microwave, residential refrigerator, touch screen premium AM/FM/CD/DVD radio, GPS with color monitor, color back-up camera and two color side view cameras. For more complete details on this unit and our entire inventory including brochures, window sticker, videos, photos, reviews & testimonials as well as additional information about Motor Home Specialist and our manufacturers please visit us at MHSRV.com or call 800-335-6054. At Motor Home Specialist, we DO NOT charge any prep or orientation fees like you will find at other dealerships. All sale prices include a 200-point inspection, interior & exterior wash, detail service and a fully automated high-pressure rain booth test and coach wash that is a standout service unlike that of any other in the industry. You will also receive a thorough coach orientation with an MHSRV technician, an RV Starter&apos;s kit, a night stay in our delivery park featuring landscaped and covered pads with full hook-ups and much more! Read Thousands upon Thousands of 5-Star Reviews at MHSRV.com and See What They Had to Say About Their Experience at Motor Home Specialist. WHY PAY MORE?... WHY SETTLE FOR LESS?